Caucher Birkar in his home garden near Cambridge, England. As a mathematician, Birkar has helped bring order to the infinite variety of polynomial equations — those equations that consist of different variables raised to various powers. No two equations are exactly alike, but Birkar has helped reveal that many can be neatly categorized into a small number of families. 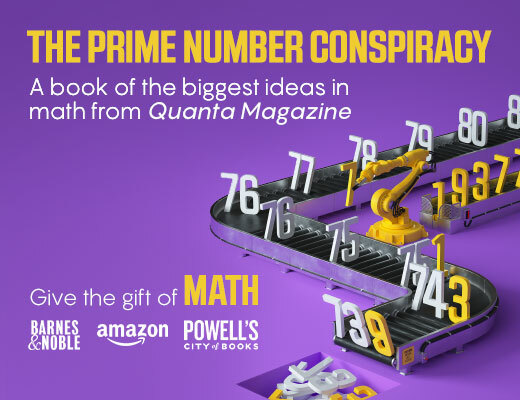 In two papers published in 2016 he showed that an infinite number of different polynomials can be defined by a finite number of characteristics — a result which demonstrated that this bewildering array of seemingly unrelated algebraic equations shares something in common. Birkar’s recent work on Fano varieties is one of his most influential mathematical results, but it sprang from an impulse that has governed him since his self-guided initiation into mathematics almost three decades ago: an impulse to create something new. When Birkar was very young, he liked to be near his mother, Sakina, while she baked bread. She remembers a scene from when Birkar was about three. “He was sitting next to me, trying to get very close to me, trying to let his feet touch my feet,” she said. Birkar’s mother told me this story over Skype. 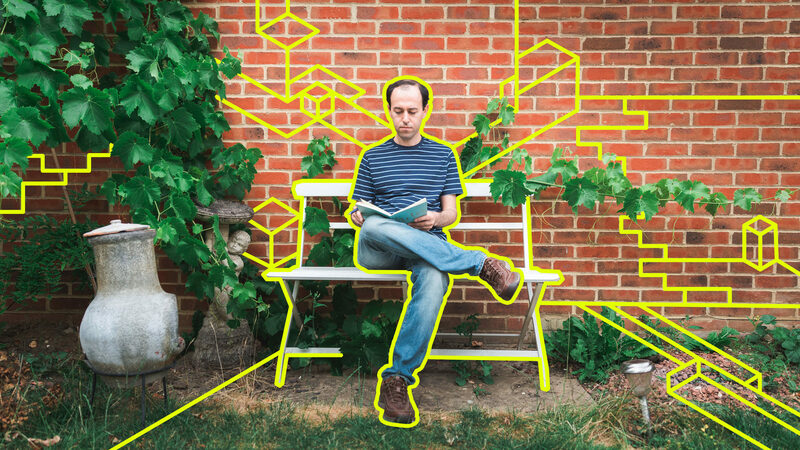 He and I were sitting in the living room of his small house in Cambourne, a community 10 miles outside of Cambridge, England, that was built from scratch two decades ago. His mother was in the family’s house in Marivan, a Kurdish village in a mountainous region along the Iran-Iraq border where Birkar’s family has lived for generations. She wore a white headscarf and was sitting on a couch between Birkar’s oldest brother and his father, Majid. Caucher Birkar was born in 1978, the third of six children. His family lived on a subsistence farm growing rice, wheat and vegetables. They also kept cows and the occasional horse. The family was self-sufficient in a way that helped shelter Birkar from the worst of the tumult that engulfed the region during his childhood — the Islamic Revolution of 1979 and the brutal eight-year war with Iraq that soon followed. “Just after I was born there was a revolution and war, but the fact that we produced everything we needed meant we could survive,” he said. Birkar’s father had attended school for a few years. His mother had no formal education at all. But Birkar and his siblings went to the village school. Around fifth grade, Birkar started to notice mathematics. “I felt something. Nothing serious, it was just a little feeling that I’m good in mathematics,” he said. Birkar remembers his brother teaching him something else as well: that knowledge can be exquisite. By high school Birkar had outrun his older brother’s mathematical knowledge and was left to learn the subject on his own. He took out books from the local library with titles like Men of Mathematics and What Is Mathematics. His family remembers him reading late into the night, often while listening to music — a habit he maintains today. Even in his first brushes with professional mathematics, Birkar wanted to do more than just admire other people’s discoveries. “I read all these books and I had the feeling that just reading things is not enough. I also wanted to create my own stuff, to create something new,” he said. As a high school student he started writing his own mathematical proofs. In college he began to submit them to mathematical journals. Later on, after he’d had some formal training, he realized that the proofs he’d found had been discovered long ago. “Maybe I didn’t prove anything significant, but just the experience, that kind of attitude, proved to be useful in the later stages of my education,” he said. Birkar tested into the University of Tehran. In his final year as an undergraduate he traveled to England. While there, he sought political asylum in response to the “political problems in Iran for people like me,” he said, referring to his identity as a Kurd, a minority ethnic group that has often suffered state-sponsored repression. The British government placed him in Nottingham, a city in central England. During the year it took for the government to process his case, Birkar met faculty members at the University of Nottingham, where he enrolled after his asylum request was granted. 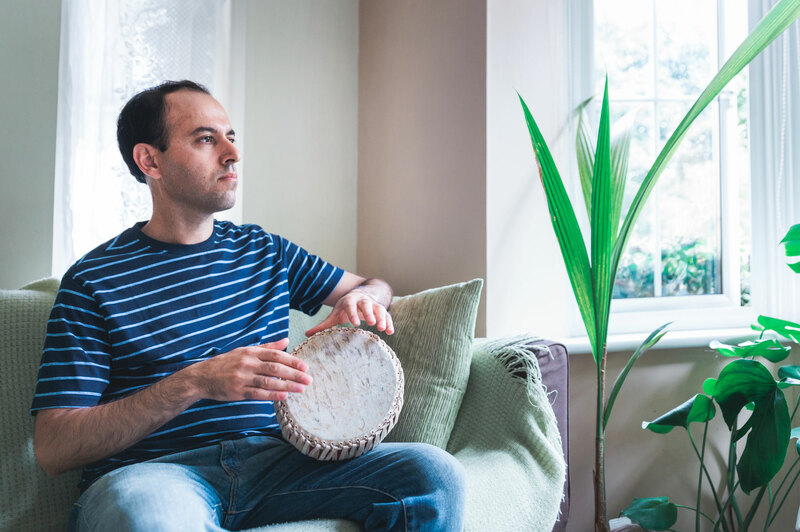 Birkar in his home near Cambridge, playing Kurdish songs on a drum from Thailand, his wife’s native country. There was no one at the University of Nottingham who specialized in algebraic geometry, the field Birkar hoped to enter. But Birkar’s official adviser there, a number theorist named Ivan Fesenko, encouraged him to attend math events outside the university. At a conference in 2002 in Cambridge, Birkar met Vyacheslav Shokurov, a mathematician at Johns Hopkins University. Early on in their relationship, Shokurov took Birkar skiing a few hours from Baltimore. Shokurov was impressed by how quickly Birkar picked it up, and also by his bearing. “He is a shy and decent person, maybe, because he grew up in a village and in a traditional family,” Shokurov said by email. At the time he met Birkar, Shokurov had been working for years in a nearly abandoned subfield of algebraic geometry called birational geometry. Birational geometry had seen some major advances more than a decade earlier, but the field had fizzled out for lack of new ideas. “The whole thing almost nearly stopped. Most people really gave up,” Birkar said. Shokurov was one of the few mathematicians who did not. 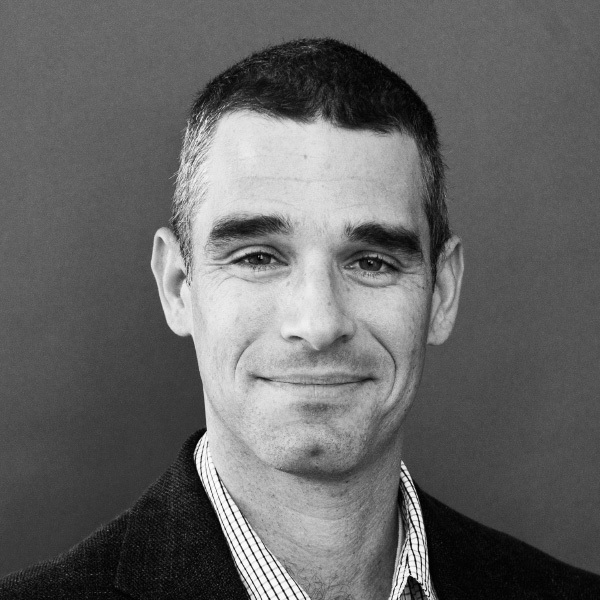 In Birkar he found a talented young mathematician who could help reinvigorate the field. In his office at the University of Cambridge, Birkar displays two photographs of the mathematician Alexander Grothendieck. Grothendieck was a refugee — he fled Nazi Germany — and a Fields medalist, just like Birkar. He is also widely regarded as the single most influential mathematician of the second half of the 20th century. In one of the photos, Grothendieck sits with a diverse group of activists involved in the French environmental movement of the early 1970s. 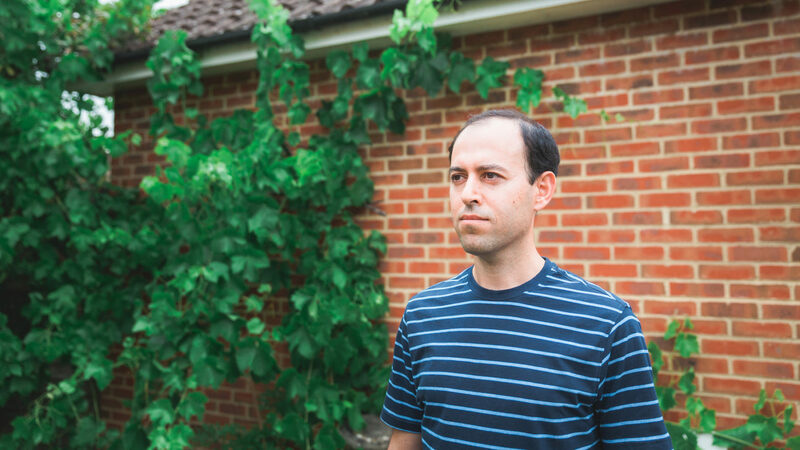 Birkar, who grew up Kurdish in Iran and now lives in England where he’s married to a Thai woman, admires both aspects of Grothendieck: his mathematical vision and the way he moved easily among different kinds of people. “All these cultures make things more interesting to me. All these cultures give you a sense of pleasure,” he said. His four-year-old son, Zanko, is a living reflection of this diversity: He speaks his mother’s native Thai, his father’s native Kurdish, and his home country’s English. 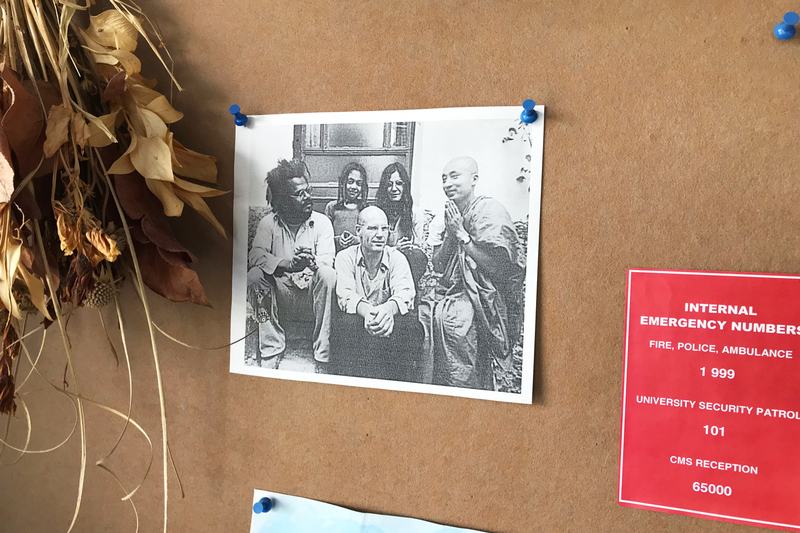 In Caucher Birkar’s office at the University of Cambridge hangs a photograph of Alexander Grothendieck sitting in the middle of a group of activists. 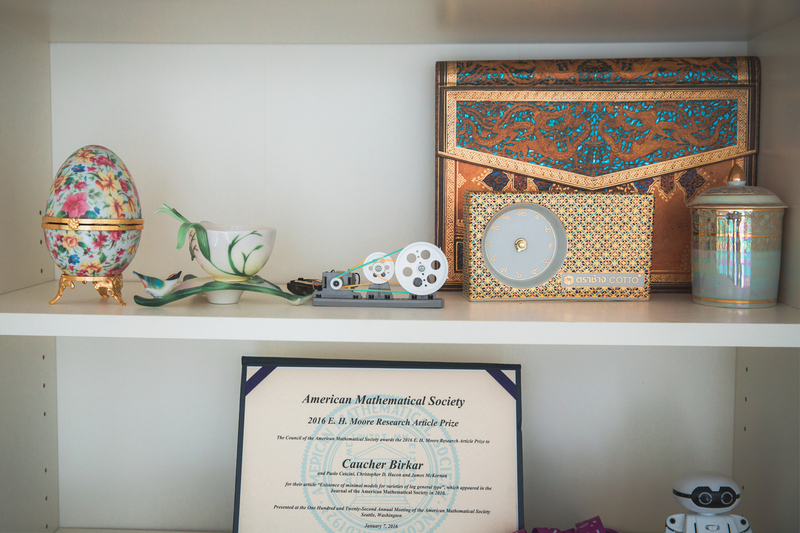 Nearby sits a collection of objects from Birkar’s travels. In Birkar’s office at the University of Cambridge hangs a photograph of Alexander Grothendieck sitting in the middle of a group of activists (left). Nearby sits a collection of objects from Birkar’s travels (right). Algebraic geometry is a blending of cultures, too. On one side there’s algebra, the study of equations, and on the other side there’s geometry, the study of shapes. The two offer different ways of looking at the same problems. Take the algebraic equation y = 2x – 3. If you plot its solutions you get a geometric object — a straight line. The two perspectives are complementary. If you wanted to identify a solution common to two equations, like y = 2x – 3 and y = 3x + 5, you could find the answer through algebra, or you could graph both equations and see where they intersect. Linear equations are the simplest algebraic equations. There are many other types. They can have more variables, and those variables can be raised to different degrees. You can also think about the set of solutions common to a group of equations. This set is known as an “algebraic variety.” An infinite number of algebraic varieties exist; each has a unique geometric representation. Algebraic varieties are an unruly mob. Mathematicians would like to impose some order on them. This impulse is not so different from the urge to classify biological life — the living world feels more tractable to our minds, and more meaningful in its shape, if we think in terms of phyla and families rather than reckon with each organism on its own. “We’re focusing on the big picture and not worrying about varieties disagreeing on some small subset of points,” said Christopher Hacon, a mathematician at the University of Utah and a leading figure in birational geometry who will be giving a speech on Birkar’s work at the Fields Medal ceremony in Rio. There are three broad birational equivalence classes: Fano varieties, Calabi-Yau varieties, and varieties of general type. The three classes are generic shapes, in the same way that the term “insect” is generic relative to the specific organisms that fall under that heading. Each class has a different type of uniform curvature (either uniformly positive, uniformly flat or uniformly negative, respectively). Mathematicians hope to be able to show that every algebraic variety reduces to one of these three types of generic shapes through the process of birational transformation. Birkar has done his most important mathematics in his dining room, working alone. On a typical day he will work at the table, getting up to pace and think, make tea, or put on music, often classical or contemporary Kurdish songs. “A lot of it goes on in my mind. Sometimes the whole day maybe I write just one page,” he said. After a few hours of thinking he likes to clear his mind with a bike ride along the trails that weave through his neighborhood. Birkar’s work on algebraic varieties is part of an ongoing effort known as the minimal model program. The goal is to prove that all algebraic varieties can be reduced to one of the three basic types through birational transformation. 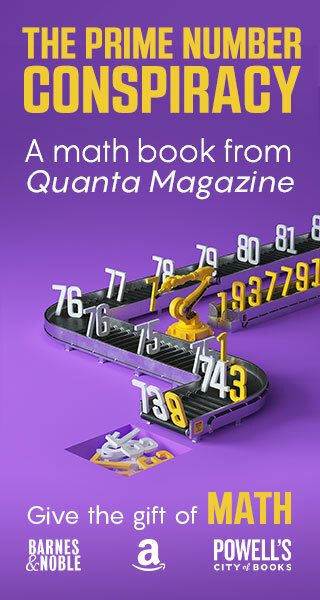 The minimal model program goes back more than 100 years to a group of Italian mathematicians who first classified two-dimensional algebraic varieties (varieties with three variables). More recently, in the 1980s, Shigefumi Mori proved that all three-dimensional algebraic varieties (varieties with four variables) reduce to one of these three types. Mori, a mathematician at Kyoto University and the current president of the International Mathematical Union, won the Fields Medal in 1990 for this work. But after Mori’s result, the field of birational geometry went quiet. “There were huge challenges to extending this to higher dimensions,” Birkar said. Video: Birkar discusses the need for originality in mathematics and in life. Shokurov was one of the few who stuck with the field through the 1990s. Due in large part to his efforts, birational geometry reawakened in the early 2000s. Since then, mathematicians have made great progress in classifying algebraic varieties in every dimension, and Birkar is among a small number of mathematicians at the center of it all. In 2006, along with Hacon, James McKernan of the University of California, San Diego, and Paolo Cascini of Imperial College London, he was co-author of a paper that explored the classification structure for varieties of general type. Hacon and McKernan later won the $3 million Breakthrough Prize in part for that work. Birkar made his biggest individual contribution to mathematics in 2016. That year he published two papers that settled one of the most important issues regarding the nature of specific types of Fano varieties. The papers proved that through the process of birational transformation, Fano varieties form a neat family that can be defined by a small number of characteristics. To understand what this means, first picture the flat plane. Now imagine all the lines that pass through a point on the plane. An infinite number of such lines exists. Now draw a circle centered on that point. Each of the lines intersects the circle at two unique places. Because of this, each line can be defined, or “parameterized,” by these points (or just one of these points). The fact that all the lines can be parameterized by points on the same neat geometric object — the circle — suggests there’s something orderly about your family of lines. If the lines were instead strewn randomly about the plane, you wouldn’t be able to make any kind of tidy statement about them all. In the 2016 papers Birkar created a similar kind of parameterization for specific kinds of Fano varieties (those of fixed dimension with “mild singularities”). He proved that, following birational transformation, Fano varieties become like the lines passing through a point: They’re in an orderly enough relation to one another that they can be parameterized by the same neat geometric object. Birkar proved that all Fano varieties in any dimension can be defined by a finite number of parameters. To say that infinitely many algebraic varieties can be defined by a finite set of characteristics is to say they share something elemental. If you create a category for organisms, and you need an infinite number of characteristics to account for all the organisms in that category, your category will be meaningless. But if you can define a seemingly discordant set of objects by means of a finite set of traits, you’ve made some progress. Birkar has proved there’s a finite number of characteristics that define Fano varieties, but there is still much more about this vast family of algebraic equations he’d like to know. When he returns home from Rio this month, he’ll get to work exploring more specific features of their geometry. He’ll do so with a newfound status among mathematicians and an awareness of just how unlikely a person he is to have achieved it. At the same time, he remains motivated by the same urge that drew him into mathematics when he first discovered the field decades ago in Marivan.